Gustav Klimt (1862–1918), Life and Death (1910-15), oil, 180.5 x 200.5 cm, Leopold Museum (Die Sammlung Leopold), Vienna, Austria. Wikimedia Commons. Gustav Klimt worked hard. For such a successful artist, he travelled little. Apart from his summer holiday, taken with his partner’s family, he spent much of his day, and most of the year, painting. Each morning he walked from his apartment in Vienna to his studio, stopping off for breakfast on the way. He didn’t engage much in café society, or apparently have a particularly active social life. His life was largely devoted to painting, and of course for his love of women, although in the latter he remained very discreet. He didn’t keep a diary, and his personal life went with him to his grave. In the summer of 1913, Klimt stayed first at Bad Gastein, then in July went to stay with the Flöge family on Lake Garda, finishing his break off in September on Attersee. 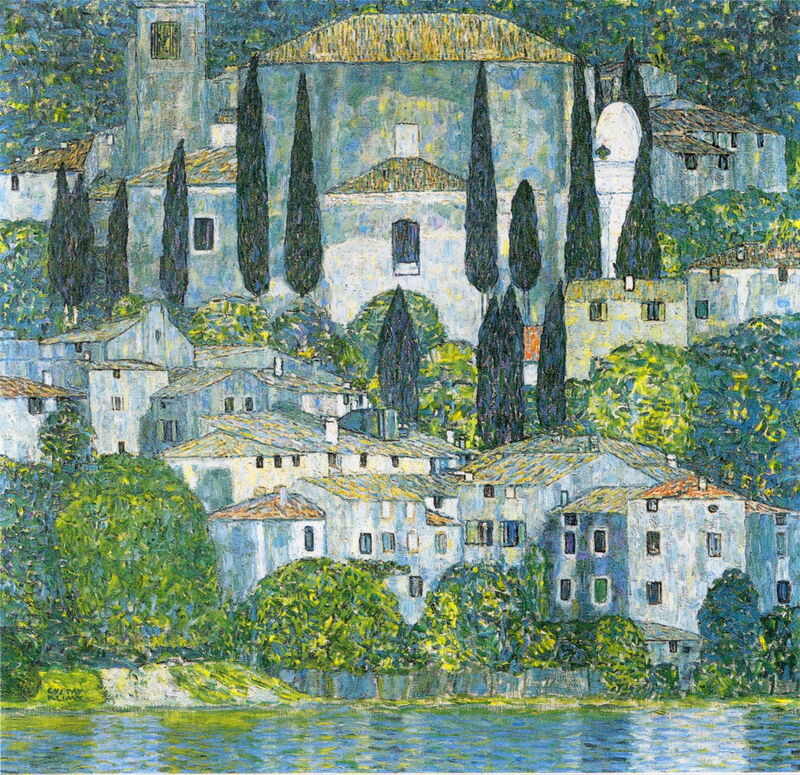 Klimt appears to have taken his telescope to Lake Garda, where he painted this view of the Church in Cassone (1913). Its flattened perspective is characteristic of the use of a lens with long focal length, as in a telescope. Another good indicator is the very small difference in scale between the houses at the water’s edge and those behind the church, even though in reality the latter must have been a significant distance from the shore. His marks have become more varied, with a range of fine brushmarks assembled in the foliage, and longitudinal strokes in the cypress trees. 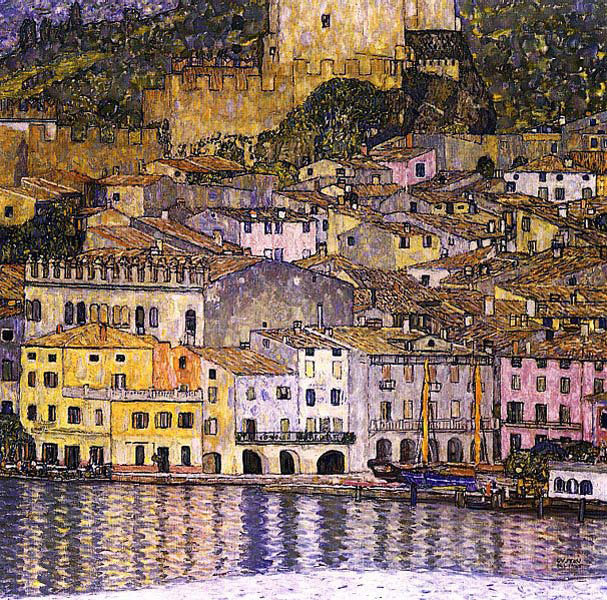 The same flattening is seen in his view of Malcesine on Lake Garda (1913). The terraced properties running to the left of the centre of the painting are shown in a parallel projection, without any nearby vanishing point, which is again characteristic of a view through a telescope or similar optical instrument. Sadly this painting was destroyed with many others in the fire at the Schloss Immendorf in 1945. 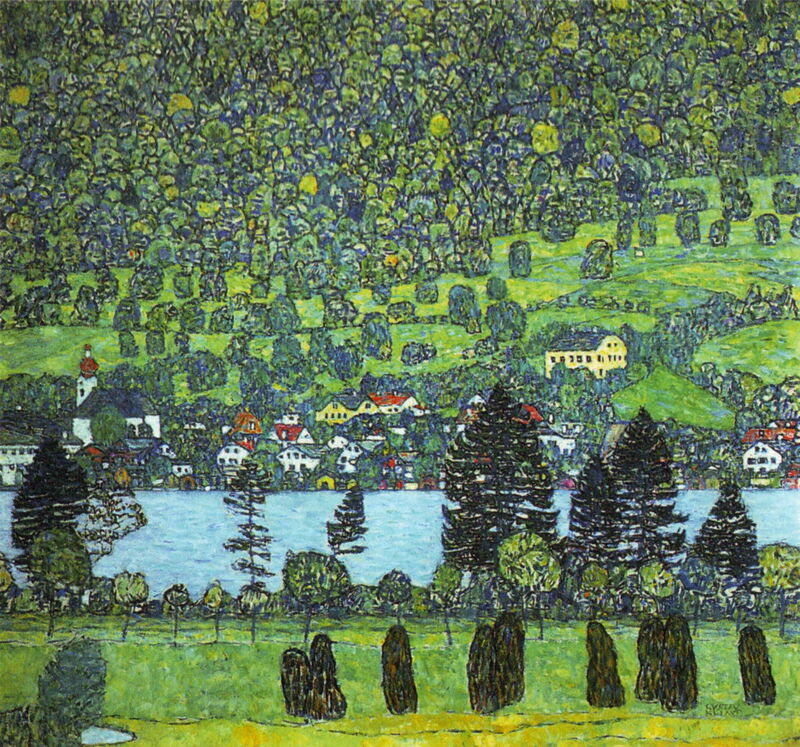 In the summers of 1914-16, Klimt took his holiday on the Attersee. Gustav Klimt (1862–1918), Litzlberg on Attersee (1914-15), oil on canvas, 110 x 110 cm, Private collection. Wikimedia Commons. 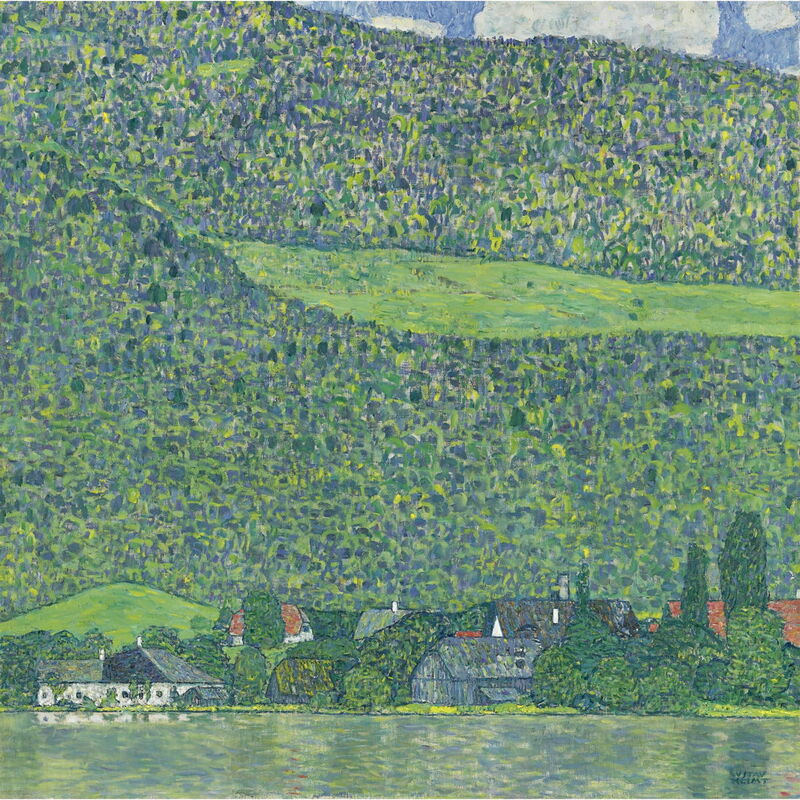 Back on the Attersee, Klimt painted this marvellously flattened view of the hamlet of Litzlberg on Attersee (1914-15). To remove any sense of depth, he has painted the trees in the two swathes of woodland without any visible change in scale due to recession. This gives the effect of two vertical planes: the nearer containing the houses and farms, and the more distant the forest and fields. This is similar to painted scenery used in the theatre, for example. 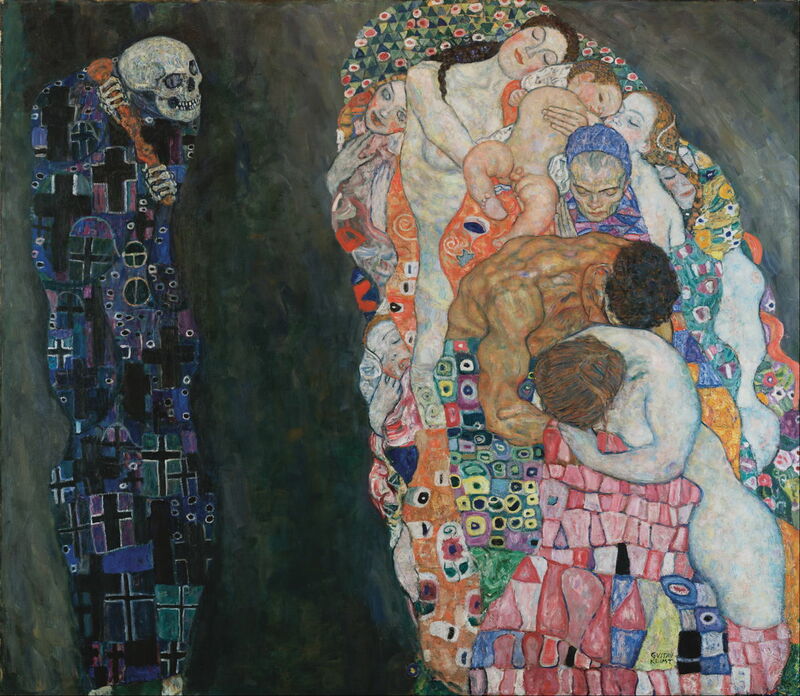 Gustav Klimt (1862–1918), Death and Life (1910-15), oil, 180.5 x 200.5 cm, Leopold Museum (Die Sammlung Leopold), Vienna, Austria. Wikimedia Commons. Klimt had started work on drawings for his Death and Life in about 1908, and completed this painting in 1915. He uses similar patterns and symbols to those of his Golden Phase, but here with a minimum of gold. At the left is the figure of death, a skull wielding a club, which resembles a church candle-holder. It is emblazoned with dark crosses and eyes/corpuscles. At the right is life, with seven bodies of sleeping women, one man, and a young boy. They are wrapped in a decorative quilt bearing brightly coloured flowers which are reminiscent of his holiday paintings of gardens. Gustav Klimt (1862–1918), Portrait of Friederike Maria Beer (1916), oil on canvas, 168 × 130 cm, Tel Aviv Museum of Art, Tel Aviv, Israel. Wikimedia Commons. 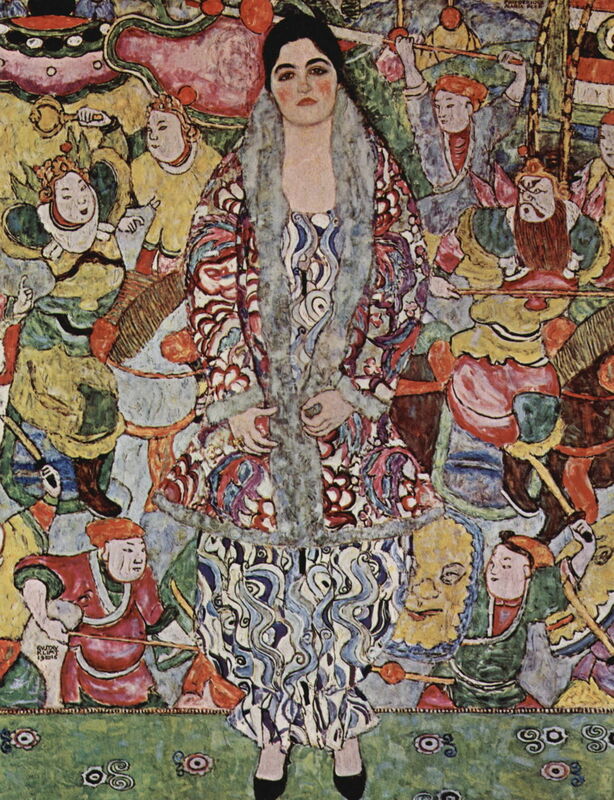 Klimt’s Portrait of Friederike Maria Beer (1916) borrows from East Asian art, with a background of warriors engaged in battle which he based on a decorated Korean vase. She almost blends in with that, in her richly-patterned clothing. Her fashionable dress was made of silk and hand-painted by craftsmen of the Wiener Werkstätte, and her fur coat was cropped in keeping with the leading edge of fashion at the time. Gustav Klimt (1862–1918), Forest Slope at Unterach on Attersee (1916), oil on canvas, 110 x 110 cm, Private collection. Wikimedia Commons. In the summer of 1916, when on holiday at Attersee, Klimt worked again through the telescope, painting this Forest Slope at Unterach on Attersee. The loss of depth makes the lake seem small, and the village, fields and trees on the far bank appear in a vertical plane. In fact, the village and meadows are on a gentle slope, with the forest behind rising more steeply, but Klimt deliberately deprives us of that reading. Gustav Klimt (1862–1918), Garden with Roosters (1917), oil on canvas, 110 x 110 cm, destroyed by fire in 1945. Wikimedia Commons. In the summer of 1917, Klimt holidayed first in Bad Gastein, then stayed with Emilie Flöge in Hintertux, in the Austrian Tyrol. 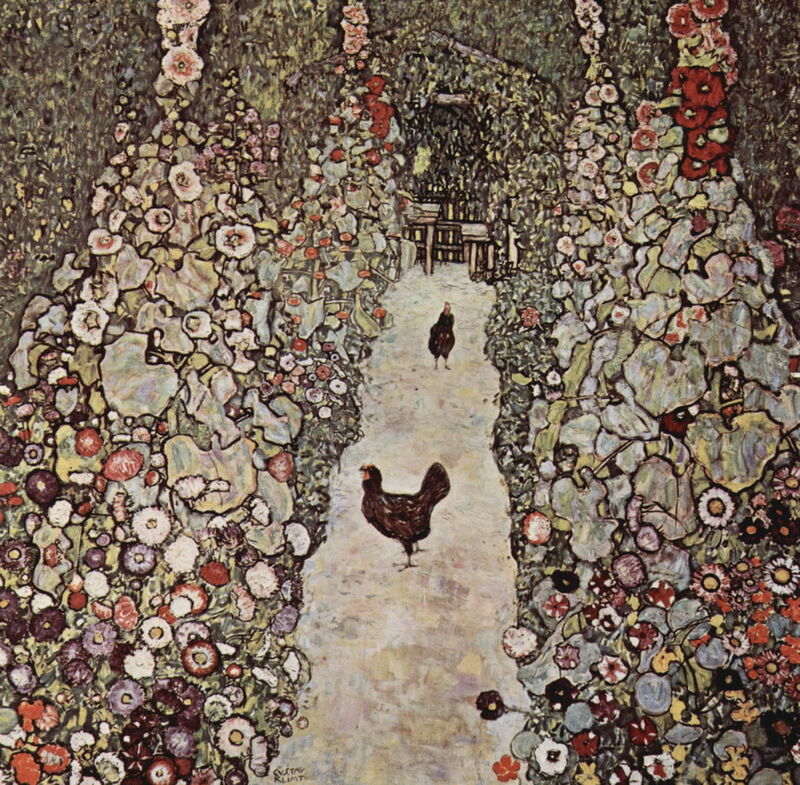 While on holiday, he painted this Garden with Roosters, which I suspect had far richer colour in its original. This work too was destroyed by fire at the Schloss Immendorf in 1945, and no better colour image has survived. Gustav Klimt (1862–1918), Adam and Eve (1917-18), oil on canvas, 173 × 60 cm, Österreichische Galerie Belvedere, Vienna, Austria. Wikimedia Commons. Klimt had almost completed this painting of Adam and Eve (1917-18), one of his few works showing biblical figures (the other notable paintings being those of Judith with the head of Holofernes, of course). Although he had not painted Eve’s right hand or the passage behind it, there is no sign of the traditional references to the Fall of Man, such as an apple or serpent. Instead, the figures are shown as a happy, loving couple, their heads leaning gently to one side, with flowers at Eve’s feet. 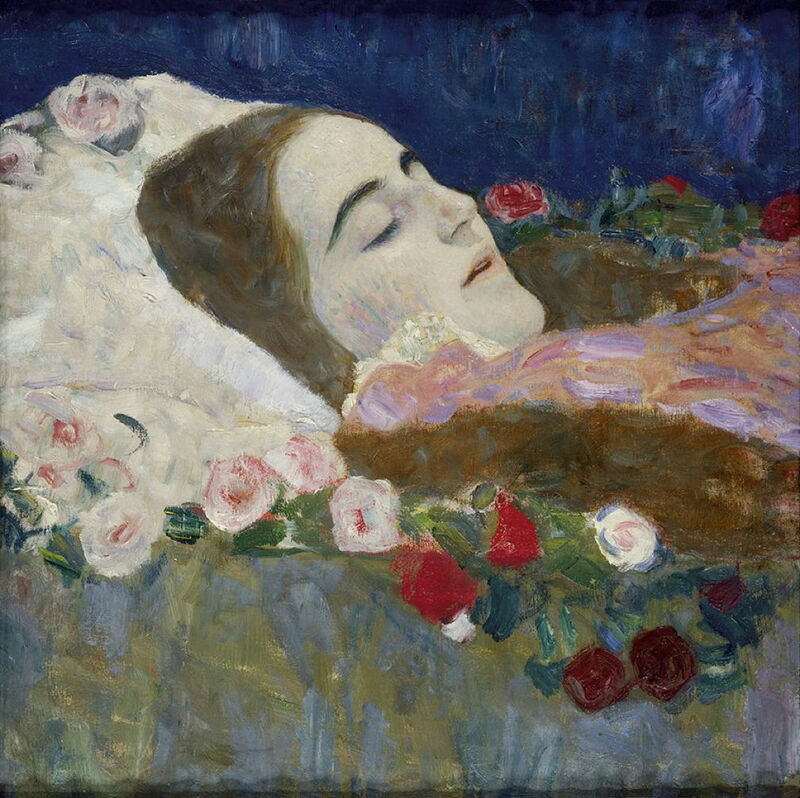 Gustav Klimt (1862–1918), Ria Munk on her Deathbed (1917-18), oil on canvas, 50 × 50.5 cm, Private collection. Image courtesy of Richard Nagy Ltd, London, via Wikimedia Commons. Maria Munk, known as Ria, had been engaged to the actor and writer Hanns Heinz Ewers; when he called off their engagement, she committed suicide just after Christmas in 1911, by shooting herself in the chest. Klimt was commissioned by Ria’s family to paint a posthumous portrait of her, and first made Ria Munk on her Deathbed, initially completed in 1912 but here dated to 1917-18. She is manifestly dead, and surrounded by floral tributes. The family rejected the work, which they found too distressing, and asked Klimt to paint her when she was still alive, from photographs. A second portrait, which Klimt completed in 1916, was also rejected, although there is doubt about the identity of the painting, and the reason for its rejection. Gustav Klimt (1862–1918), Posthumous Portrait of Ria Munk III (c 1917-18), oil on canvas, 180.7 × 89.9 cm, Private collection. Wikimedia Commons. Klimt started his third Posthumous Portrait of Ria Munk in 1917, and was still working on it early the following year. It was clearly going to be another richly-decorated painting, with abundant colourful flowers in the background, and brilliant peppers and other vegetables. In early January 1918, Klimt is thought to have caught the deadly influenza which was just starting to spread across Europe at the time. He quickly developed pneumonia, suffered a stroke, and died on 6 February 1918. He was 55. Later that year, as the influenza became a global pandemic, it claimed the lives of many artists in central Europe and beyond. Overall, it is estimated to have killed 50-100 million people, between three and five percent of the world’s population at the time. Klimt could have had no knowledge of his imminent death, but in his last years his figurative paintings of Death and Life, Adam and Eve, and finally of the tragic Ria Munk anticipated his own end. It’s a great shame that he never painted a self-portrait. What was Klimt’s reason for painting his landscapes flat, through a telescope? Was it to give a different perspective to that of the usual depth of field? & if so why. i know nothing about art, so i apologize if i ask you a thousand questions. Some say the Spanish flu caused the outbreak of Encephaliitis Lethargica, some that it may of been coincidence. Did Klimt during his illness become catatonic? Thank you – very good questions! Klimt refused to explain his art, and directed critics and others to look at the art. So he did not explain this himself. I think that he started to explore the role of texture, form, and colour in landscape images before he looked through a telescope, and realised how they overlapped with the type of decoration which he was developing in his figurative painting. When he saw how a telescope could remove the impression of depth, he then used that as a means of exploring its effects on landscape views. There is very little information about Klimt’s terminal illness. Some claim that he suffered the ‘Spanish’ influenza, although it was only just starting to travel in Europe at the time. He does seem to have suffered a catastrophic pneumonia, for whatever reason, and that seems to have led to his stroke. I haven’t seen anything to suggest he might have suffered anything else. I don’t think that he did this in any quest for originality. Klimt had already attained that without any conscious effort, I think. I think that his holiday paintings were explorations of issues which he found interesting at the time, combined with relaxation by repetition in painting all those marks. Remember that images of lost depth like these were still relatively uncommon – the first telephoto lenses for cameras had started to appear, so the telescope was the only common optical instrument which created them. I think that he became fascinated by the different look that it gave familiar views. That seems to be what the paintings show.